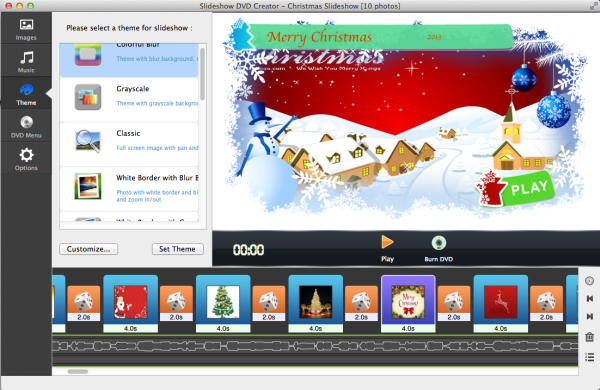 Next is about how to make a DVD photo slideshow for your Christmas. Whether you want to make your Christmas party more fun, or keep memory about your Christmas, it is good to make Christmas photos and fabulous music into slideshow, and make it into DVD for keeping. Although we have Christmas every year, but each one is different. Photos can keep record of growth experience and the happy hours. And it’s really simple to make your own Christmas DVD photo slideshow. Here we will use Slideshow DVD Mac. You can download the software for free from : http://www.slideshowdvdcreator.com . After you launch the software on your Mac, click the “Images” button to add your Christmas photos. Drag & drop the photos into the software directly to add them. After that, you can drag them to change order. 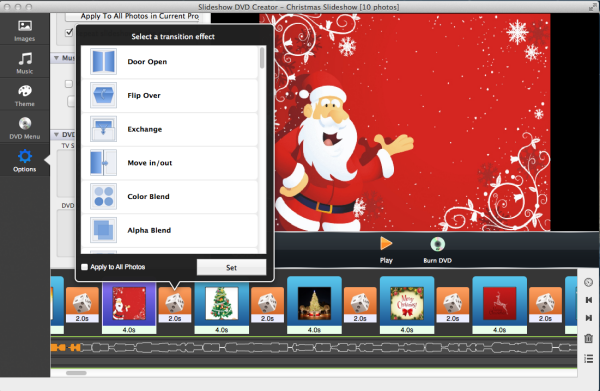 And Slideshow DVD Creator has prepared many transition effects for you. You can select to determine how your photos will display. Just click the button between photos, the transition effect list will appear. You can set different effect for each photo, or one for all photos. Also there are display time for each photo and transition effect. You can also make change of them. Next, you can add music to slideshow by clicking the “Music” button next to “Images”. For best Christmas songs, please go to: Best 20 Christmas songs. You can add more than one music for one slideshow. Click the “Theme” button to choose theme for your slideshow. You can also insert blank image, sync slideshow & music, set Pan & Zoom effect for your photo etc for your slideshow. Here we won’t explain in detail. You can download the free software to have a try by yourself. If you are done with the slideshow, click the “Play” button to have a preview of the slideshow. Next set “DVD Menu” for your Christmas photo slideshow. Here is a “NO MENU” option for you, if you don’t want to use any menu theme. And you can even set DVD background music by the “Select Music…” button. Finally insert a DVD disc into your Mac, and click “Burn DVD” button to burn it. Or you can flower step below to burn your DVD. Now your Christmas DVD photo slideshow is ready. Play it through DVD player or others. This entry was posted in DVD Photo Slideshow, slideshow dvd mac and tagged christmas dvd slideshow, christmas slideshow, dvd phot slideshow on November 25, 2013 by Sarah Jablich. Halloween is coming soon. How about make a spooky frightening slideshow for your Halloween party, so you can have more fun with your friends. If you have no slideshow knowledge background, there is no need to worry about. All you have to do is collect the photos you want to use, and select some halloween music which you want to add as background music. For good Halloween songs, you can look at : Best songs for your Halloween slideshow. After you have collected the photos and music, next with Slideshow DVD Creator you can make a eye-catching slideshow within minutes. First, download the slideshow dvd creator from the website, and install it to your computer. After you launch the software, you can add the photos and music into in by the “Images” and “Music” button appears in the left panel. Of course, you can set the order of the photos by dragging them directly. Click the music name appears below the list of the photo, you can select to change order, or delete the music. Slideshow DVD Creator doesn’t have a music trimming function, but you can set time for each photo and transition effect to make the slideshow and music synchronized. Or you can click “Option” – “Music” – “Sync music & slideshow” to do the same job. Slideshow dvd creator has prepared many transition effects for you. You can set different effects for different photo, or apply one effect to all the photos. The transition effect determines how your photos will be displayed. Here are more functions you can make use of. Such as set theme for your slideshow, add text onto photos, insert blank image into the slideshow, set Pan & Zoom effect and so on. After all things done, you can select to export the slideshow as mp4 or mov video format, or burn the slideshow into DVD, so you can play it on TV through DVD player. This entry was posted in slideshow dvd mac and tagged halloween photo slideshow, halloween photo slideshow dvd, halloween slideshow, halloween slideshow mov, halloween slideshow mp4 on October 30, 2013 by Sarah Jablich. It’s really fun to turn your still photos and music into slideshow DVD, and enjoy it with families or friends. There are many free tools can help you achieve that. 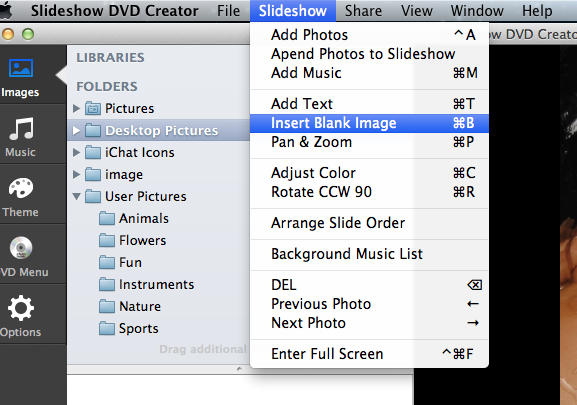 Today, I want to show you how to use Apple’ iDVD to make your own slideshow DVD quickly. But notice, iDVD is not available in Mac OS X 10.7 or higher now. So for Mac OS X 10.7 or higher users, you can use Slideshow DVD Creator instead. To begin building the slideshow, first click “Media” button in the right bottom corner, then you can see three tabs “Audio / Photos / Movies” appear. Select one, then you can drag & drop the photos, music or movies to add them into the slideshow. Next, click the “Themes” button next to “Media”, there will appear a list of ready-to-use themes you can use. And you can also add background pictures by dragging a photo into the theme’s background. You can have more control over your slideshow using iDVD. In the bottom of the windows, you can set slideshow duration to specify the time each slide plays; Transition helps you set transition effect to govern how one slide turn into another; Slideshow volume helps you control the volume. Click the “Setting” button, then you can have more control over your slideshow. Find out it by yourself to have more fun. When you finish the slideshow, click play button to preview it. If satisfied, click the “burn” to make your DVD. After it finished, you can enjoy the DVD on Apple TV, PC or other portable DVD movie players. This entry was posted in slideshow dvd mac and tagged iDVD slideshow, idvd slideshow DVD, photo slideshow DVD iDVD on October 14, 2013 by Sarah Jablich. Because the high resolution of iPad camera, we all like to use iOS devices to take photos or videos. But sync it back to computers or other iOS devices using iTunes is a big problem. There is one time iTunes erased all of my videos and photos automatically, and I even cann’t restore them. And about slideshow, I’d like to make photos into slideshow to keep them, because slideshow is much more stunning than still photos. So here I want to show you how to make slideshow using photos from your iPad/ iPhone/ iPod touch. 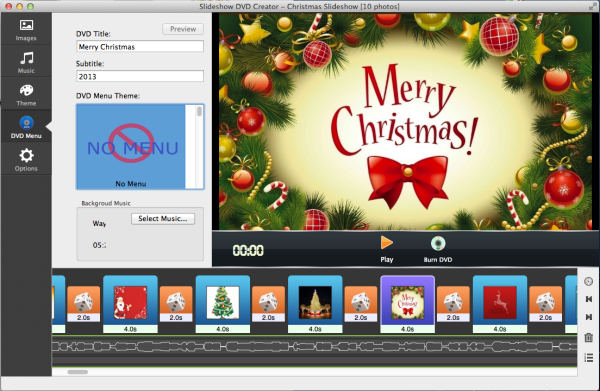 We will use two wonderful toos, which are wireless transfer app and slideshow dvd creator. 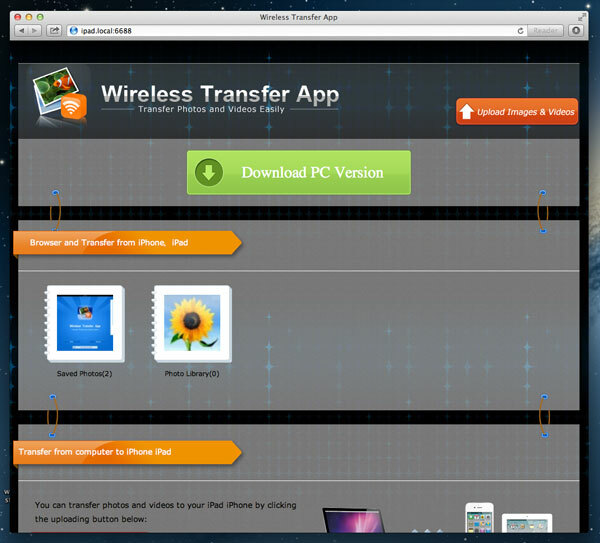 Wireless transfer app can help you transfer photos and videos between iPad/ iPhone/ iPod/ Windows/ Mac freely using wifi, without iTunes or USB cables. It recently upgraded to the newest version 3.5 which can run on iOS7 perfectly. 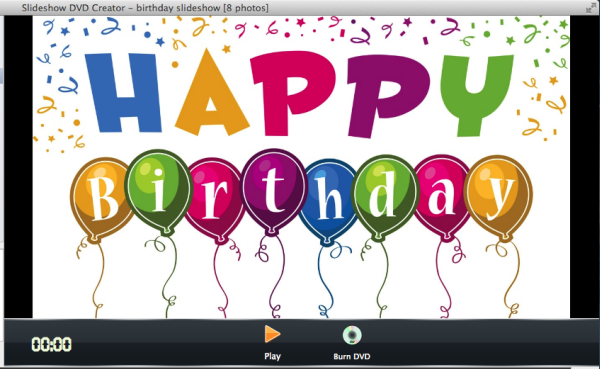 Slideshow dvd creator can help you create a professional-looking slideshow within minutes. First, we have to transfer photos from iPad to computer. 3. 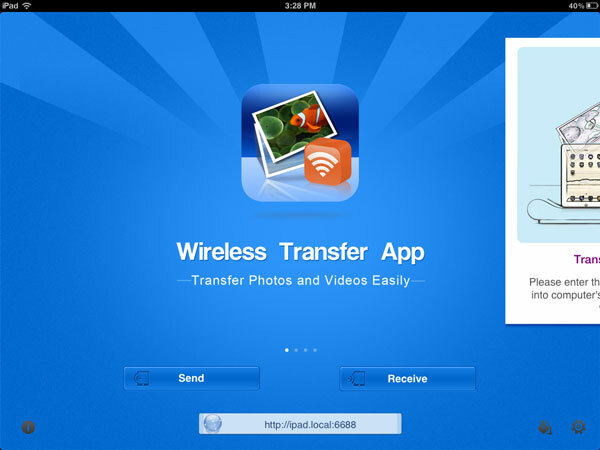 Run Wireless Transfer App on iPad, and be sure to keep it from sleeping. 4.Input the URL link exactly as it appears on the iPad into the browser (IE, Chrome, Firefox and so on) to go to the transfer page. 5. Select one album then you can download photos one by one or in batch. Second, we can make photos downloaded into slideshow. 1.Download Slideshow DVD Creator from http://slideshowdvdcreator.com/. The download is free. 2.Click “Images” on the left panel of the soft, then you can select one folder and drag & drop the photos to add them. 3.Directly drag the photos in the list to change the order according to your need. 4.Click the button between photos to add transition effects. 5.Click the time shown on the photos to set play time for each photos and transition effect. 6. There are other things you can also do : add songs as background music; add theme; add text into photos; set Pan & Zoom effect; sync slideshow & music and so on. There are also other functions you can find out by yourself. 7.If you are satisfied with the slideshow you made, you have 2 choices now : a. export it into mov or mp4 video format; b. burn it into DVD. For more information, you can go to : http://slideshowdvdcreator.com/make-slideshow-dvd-on-mac.html . This entry was posted in slideshow dvd mac and tagged iPad photos slideshow, iPad photos transfer, iPad photos wifi Mac on October 9, 2013 by Sarah Jablich. Every year we grow older, and things just keep changing around. So although we have birthday every year, each birthday is just different, and each one is important. Photo is a good tool for me to keep the memories ,growth experience or just happy times. 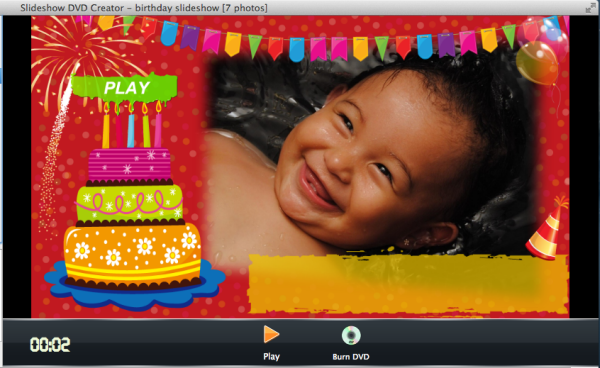 It’s also a good idea to make the photos into beautiful birthday slideshows for birthday party. Good birthday songs is also indispensable. I have found some : http://slideshowdvdcreator.com/best-songs-for-your-birthday-slideshow.html . So here let’s go into the main topic about – How to make a birthday slideshow for your family or friends. It’s very simple. First, there are somethings we should prepare in advance: photos of course, songs, a slideshow software. We will use Slideshow DVD Creator, for it is the simplest software I’d ever used. 1. Download the software and install. The software can be downloaded for free from : http://slideshowdvdcreator.com. This free version has the 36 photos limitation, so please notice. 2. Add Photos and songs into software. 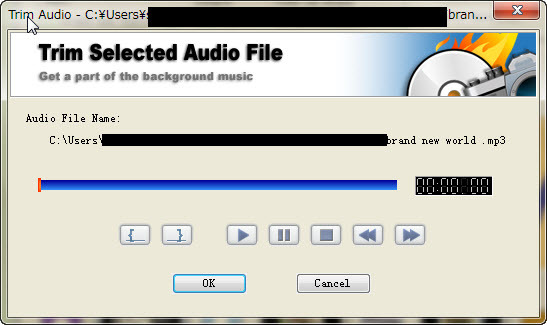 In the left panel of the software, there are “Images” and “Music” button on it. Click the two button to go to the folders which contains the photos and songs. Just drag & drop them, you can have them added. If you’d like to change the order of the photos, drag them in the photos list directly. If you’d like to change the order of the songs, click the name of the songs, then change them in the pop-up dialogue. 3. Insert a blank image into the beginning and add some text into it. Click “Slideshow – Insert blank image” from the menu bar of your Mac, then you can select a blank image from the “Add a Blank Image” dialogue . Drag it to the beginning. Next you can add transition effect for your photos. Then set time for them to make the slideshow more desirable. After you finished the slideshow, you can click the “Play” to preview it. Then you can encode it into mov/ mp4 video format, or burn it into DVD by using the built-in DVD player. This entry was posted in slideshow dvd mac and tagged birthday slideshow, birthday slideshow dvd, birthday slideshow mov, birthday slideshow mp4 on September 25, 2013 by Sarah Jablich. You may like to make your photos into slideshow and enjoy it. But you may be headache when you want to upload the slideshow to, such as Youtube or Facebook, or when you want to sync the slideshow to your mobile phones so you enjoy it on trip and so on. There are many slideshow software you can find online, free or paid. And there are some which can encode slideshow to video format. But which one is the best. I recommend MP4 since it is the most widely supported. So here I want to show you how to make your own slideshow and encode it to the MP4 format. So you can enjoy as you like. 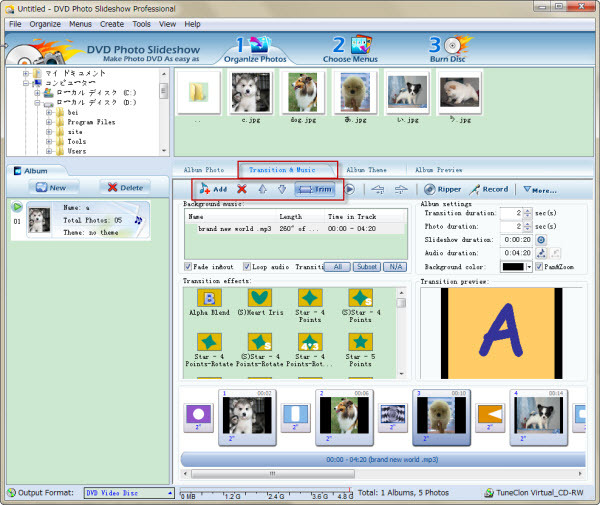 The software I chose to use is Slideshow DVD Creator. 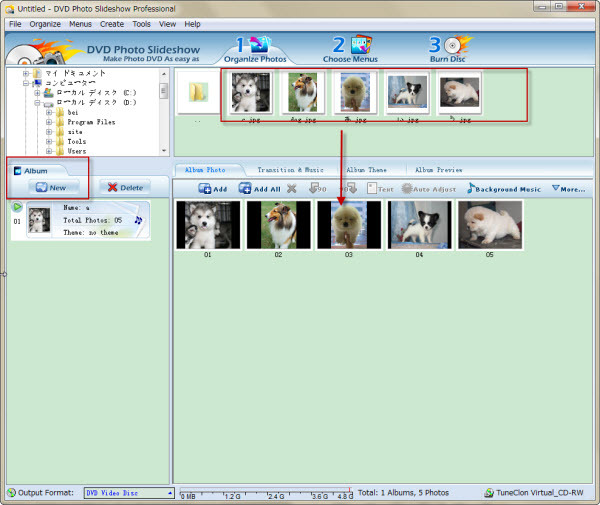 According to its name, you can know that it is a dvd photo slideshow software. But it can not only burn slideshow to DVD, but also can encode slideshow to MOV/ MP4. Of course, it is convenient if you also want to burn your slideshow to DVD, for it has the built-in DVD burner. OK, back to our topic, Let’s see how to make slideshow in mp4 format. 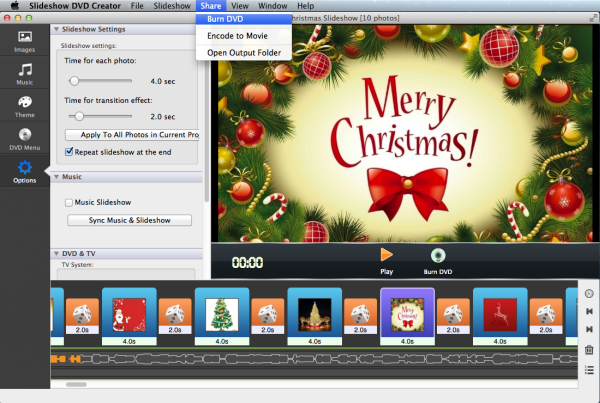 Next, decorate your slideshow by using the transition effects and themes which the software provides. There are many other functions you can search by yourself. It’s very simple to find out. Such as: add empty images; add text into photos, sync the slideshow & music; Pan & Zoom effect; set play time for each of your photos and transition effects and so on. After you finish your slideshow, click “play” button to see it. 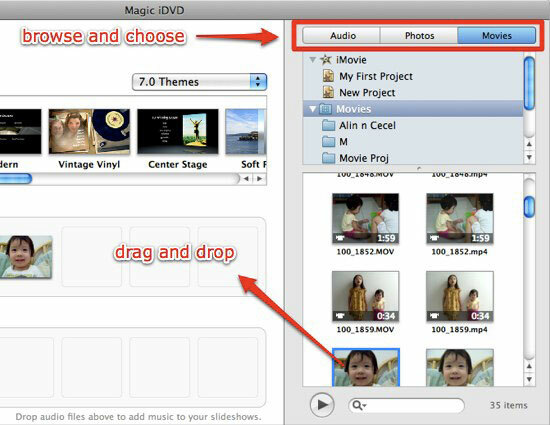 If you are satisfied with it, click “Slideshow DVD Creator” in left top corner of your Mac screen, to specify video output format(MP4) and video format. Click “Share -> Encode to Movie” from top menu bar, in “Share Video” window, enter title and description, select Video size(such as 1080p). Finally click “OK” , the program will begin to encode the slideshow to a video file. You now have your MP4 slideshow video. This entry was posted in slideshow dvd mac and tagged mp4 slideshow, slideshow mp4 Facebook, slideshow mp4 Youtube on September 17, 2013 by Sarah Jablich. When making slideshows using still photos, it’s a good option to add some songs to be the background music, and it’s will be better if the song is suitable with the theme which the slideshow wants to express. Sometimes people may want to trim the length of the songs they are using, so it fits better with the photos; and perhaps you may also want just use a part of the song which you like best. Using the DVD Photo Slideshow, you can do it very easily. DVD photo slideshow is a slideshow-making tool, you can use it to make slideshow in minutes, and encode it to mov/ mp4 or other video format; burn slideshow to DVD/ VCD or upload it to Facebook/ Youtube/ myspace directly. Also it has many other fabulous functions, if you are interested, you can go to : http://slideshowdvdcreator.com/dvd-photo-slideshow.html to find more about the software. Here, I will not show you how to make a slideshow step by step, but how to trim the length of the songs before you add it as background music for your slideshow. First, download and install the software to your computer. Notice that the download is free, so download to have a try freely. It will show you three steps to make slideshow : 1. Organize photos; 2. Choose menus; 3. Burn disc. Just follow the step to make your own slideshow. Second, in the left “Album” panel, you can click the “New” to create new project. And select the folder which contains the photos you want to use, then drag & drop them into your new album from right top panel. You can add far more than 5 photos like I did here. Third, go to “Transition & Music” tab. Here you can select transition effect for your photos, and set duration time for both your photos and transition effects. Of course, here you can manage your music. In the “Background music” box, there will be a default.mp3 music for you, you can keep it or delete it to add your own music. Forth, After you added your own music, click the “Trim” button, then a dialogue will pop up. Here you can trim your audio file according to your need. After that, you can set the duration for your photos and transition effects to make them fit. This entry was posted in DVD Photo Slideshow and tagged slideshow software trim length, Trim music length, trim slideshow song on September 16, 2013 by Sarah Jablich.